Launched in New York at the Sustainable Finance Forum by Affirmative Investment Management (AIM) and ISS-climate, the Carbon Yield Insights Report summarizes the experience of applying the Carbon Yield on over 55 green and sustainability bond issuers over two years, as part of AIM’s impact reporting. The issuers combined have financed over 800 projects across 80 countries. The Carbon Yield initiative—launched in 2016 with support provided through The Rockefeller Foundation’s ‘Zero Gap’ innovative finance portfolio —is one of the first methodologies to present a comparable, quantifiable metric that can be used by a variety of stakeholders, such as issuers, investors and analysts. The methodology looks at the projects financed via a green bond and then allocates to the bond the greenhouse gas emissions (GHG) mitigated based on the projects’ capital structure. Since 2008, green bonds have presented a viable potential scalable solution to fund climate change mitigation and adaptation projects – growing to over US$340BN in terms of amount outstanding. The vast majority of green bonds aim to fund mitigation-related activities, making them a powerful tool for supporting the Paris Agreement, the global initiative to limit the human-induced global temperature increase from pre-industrial levels to two degrees Celsius within this century. The scale of mitigation, however, can vary greatly across green bonds and their funded activities. The Carbon Yield methodology provides transparency and information to investors and policymakers about the climate change mitigation potential of diverse projects to guide allocation of capital to optimize for GHG abatement. Investors can aggregate the Carbon Yields of different bonds in their investment portfolios to obtain a portfolio level Carbon Yield. This can then be communicated to their own investors and other stakeholders as part of their impact reporting. By using the Carbon Yield, investors can ensure that the mitigation impacts of their green bond holdings are being calculated consistently. The new Carbon Yield Insights Report summarizes the experience and five key findings in applying the Carbon Yield, over a broad range of issuers – from European corporations to multinational development banks – and more importantly, a broad range of funded activities across a breadth of geographies. Renewable energy generation remains the most prominent sector in high Carbon Yield results– that is, renewable energy generation results in larger amounts of GHG emissions avoided per $1,000 invested than any other sector. A global comparison of Carbon Yields shows an inherent bias towards renewable energy generation investments, particularly in emerging markets, due to their carbon-intensive grids and heavy reliance on fossil fuels, when looking at the GHG avoidance results alone. Going forward, as the green bond market expands, it may be more appropriate to compare the Carbon Yields within a region or on a peer basis. Projects targeting energy efficiency show mixed results. The context in which, and the sector and technology where these efficiencies take place, matters. For some investors, investing in improving energy efficiency in carbon-intensive, fossil-fuel based technologies may be considered a highly impactful strategy and part of a low-carbon transition, while others may find it highly counterproductive in the journey towards a two-degrees future, since the project would make carbon-intensive technologies more competitive and long-lasting. The user of the Carbon Yield data therefore needs to consider the metric in relation to the above – it is not always the case that the larger the number the better. As a measure of impact on investment – costs matter. Technology capital and operating costs differ across geographies. Project costs and the green bond investment share of the total project cost are also critical to appropriately allocate impact. Currently this information can be very difficult to ascertain, and the report highlights the importance of this type of data in limiting double counting. The Carbon Yield methodology is unique in its guidance on apportioning impact to fixed income investments and recognizes the role of both equity and debt capital for the activities funded. Carbon Yield results quality is highly dependent on data accuracy and availability. There is a considerable variation in issuer reporting and further disclosure, but in the past two years, there has been improvement, and most issuers are interested and willing to engage with investors, such as AIM, to provide better information. The state of reporting would likely improve if more investors showed a greater interest in the results, which includes querying the reported data and requesting information where gaps exist. GHG emissions footprint data helps contextualise abatement results. In 2018, AIM and ISS-climate introduced GHG emissions footprint analysis, to supplement the Carbon Yield, a measure of emissions avoidance. This is to help mitigate some of the high baseline effects found in the Carbon Yield – for example, a Swedish green building project may have a low carbon yield, resulting from a smaller differential between project and baseline emissions as buildings are generally built to higher efficiency standards. However, the overall Scope 1 and 2 emission levels may be lower compared with a project in another country yielding higher levels of avoidance due to higher baseline emissions. Both types of information are important. — Stuart Kinnersley, Co-Founder and Managing Partner, AIM. — Saadia Madsbjerg, Managing Director, The Rockefeller Foundation. This methodology, funded by The Rockefeller Foundation, was produced as a collaboration between Lion’s Head Global Partners (LHGP), ISS-ESG and Affirmative Investment Management (AIM). The Carbon Yield does not offer investment advice and does not hold views on any specific investment, investment tool or investment strategy. Download the full summary of the Carbon Yield methodology here or visit the official website http://carbonyield.org/ . ISS ESG is the responsible investment arm of Institutional Shareholder Services Inc., the world’s leading provider of environmental, social, and governance solutions for asset owners, asset managers, hedge funds, and asset servicing providers. Under the ISS ESG umbrella are three discrete units that draw on deep historical and industry expertise, including: ISS-ethix, which enables investors to develop and integrate responsible investing policies and practices, engage on responsible investment issues, and monitor portfolio company practices through screening solutions; ISS-climate, which provides data, analytics and advisory services to help financial market participants understand, measure, and act on climate-related risks across all asset classes; and ISS-oekom, which provides corporate and country ESG research and ratings and enables its clients to identify material social and environmental risks and opportunities including through advisory services. ISS ESG clients rely on the expertise of all three to help them integrate responsible investing policies and practices into their strategy and shareholder voting decisions. For more information, visit issgovernance.com/esg. For more than 100 years, The Rockefeller Foundation’s mission has been to promote the well-being of humanity throughout the world. Together with partners and grantees, The Rockefeller Foundation strives to catalyze and scale transformative innovations, create unlikely partnerships that span sectors, and take risks others cannot –or will not. For more information, please visit www.rockefellerfoundation.org. The Carbon Yield enables investors to determine the potential avoided emissions of Green Bonds. Affirmative Investment Management launches inaugural impact report for its Impact Cash+ fund and co-launches Carbon Yield, an open access green bond impact quantification tool. London, 27th June 2017. 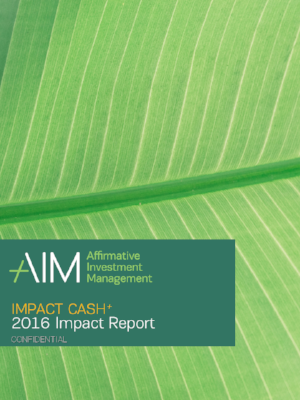 Affirmative Investment Management (AIM), the dedicated green and social bond fund management company, launched its 2016 Impact Report for the Impact Cash+ fund. The flagship report includes key environmental and social sectors and geographies in which the portfolio is invested; environmental and social impact metrics, and alignment to the United Nations Sustainable Development Goals (SDGs). AIM is committed to advancing developments in the green and social bond market through impact reporting across its portfolios, and is working with key partners to develop industry tools to facilitate best practice in the green and social bond market. Through active engagement with bond issuers and peers on reporting requirements and practices, AIM seeks greater harmonisation in impact reporting. AIM has also co-launched Carbon Yield (www.carbonyield.org), along with South Pole Group (climate reporting specialists) and Lion’s Head Global Partners (a financial advisory firm), with funding from the Rockefeller Foundation. The Carbon Yield methodology is open access, and provides a common approach to quantifying the emission reductions or reduction potential of use of proceeds bonds. Carbon Yield calculates the tonnes of CO2 equivalent avoided per year, per unit of capital. AIM is the first investor to apply this methodology to a portfolio: AIM’s Impact Cash+. In addition to greenhouse gas emissions avoided, AIM is developing additional reporting tools and methodologies in recognition of the broad range of impacts expected and achieved from green and social bonds, such as the estimated number of children vaccinated in developing countries, jobs created and/or retained, or number of people with access to cleaner water. All of AIM’s investments are mapped against the 17 SDGs. For further detail on AIM’s 2016 impact reports please contact AIM directly. The Rockefeller Foundation, Lion’s Head Global Partners, South Pole Group and Affirmative Investment Management launch the Carbon Yield. London, 19th June, 2017 - Launched today, the Carbon Yield, quantifies the climate change mitigation that Green Bonds enable, allowing issuers and investors alike to better understand the impact of their activities and portfolios. The methodology for calculating the Carbon Yield is publicly available at www.carbonyield.org. Pioneered by Lion’s Head Global Partners, South Pole Group and Affirmative Investment Management (AIM), with support from The Rockefeller Foundation, the new methodology comes at a time when the Green Bond market is set to exceed $100bn in issuance and demand continues to outpace supply. Green Bonds have steadily become one of the most successful instruments for socially responsible investors to harness the power of capital markets in the fight against climate change, allowing for the scaling up of climate change mitigation and adaptation activities. The “greenness” of Green Bonds to date, however, has been a largely qualitative attribute. As the Green Bond market moves towards a greater understanding of what investments enable, methodologies such as the Carbon Yield provide a common framework for issuers and investors to communicate the impact of their cashflows on the environment and enabling more transparent communications - ultimately catalysing further investment in the segment. Despite significant progress in the harmonisation of reporting across issuers and established voluntary guidelines, such as the Green Bond Principles and Climate Bond Standards, there is no common language in the market on quantifying and communicating the emissions abatement impact of Green Bonds. Whilst many issuers already collect the necessary data to disclose the mitigation impact of their projects, the market does not have a consistent, uniform metric to refer to. At the same time, investors are attempting to independently calculate the mitigation impact of their portfolios but do not have access to consistent data across issuers. The open access Carbon Yield methodology provides a common approach to the market resulting in a comparable metric quantifying the mitigation impact of Green Bonds on a prospective basis in terms of GHG emissions avoided per unit of capital per annum through the financed activities. The impact quantified by the Carbon Yield is expressed in Potential Avoided Emissions (PAE) enabled by the use of proceeds in terms of tCO2e/year/unit of capital. In other words, how many tonnes of carbon dioxide equivalents (tCO2e) are expected to be avoided per year per unit of investment. This approach seeks to increase transparency in the Green Bond market via a metric which is simple to understand and can be applied to any Green Bond. Significantly this would allow issuers to communicate the Carbon Yield of their framework at the point of issuance of a new transaction. This allows for better comparability across different issuances and easier aggregation of impact across portfolios. Going forward, the consortium of partners hopes to expand the reporting of the environmental impact of Green Bonds to include factors beyond GHG abatement, such as indicators for water efficiency/savings. The Carbon Yield methodology is designed to be used by green bond issuers and investors, and is being pioneered by AIM as part of their annual impact reporting published in June 2017, reporting on the mitigation impact per year per $/€1,000 of their impact bond funds. We are proud to be part of pioneering such a pivotal breakthrough in the Green Bonds space. This methodology, funded by The Rockefeller Foundation, was produced as a collaboration between Lion’s Head Global Partners (LHGP), South Pole Group (SPG) and Affirmative Investment Management (AIM). The Carbon Yield does not offer investment advice and does not hold views on any specific investment, investment tool or investment strategy. Download the full summary of the Carbon Yield methodology here or visit the official website http://carbonyield.org/ . For more than 100 years, The Rockefeller Foundation’s mission has been to promote the well-being of humanity throughout the world. Today, The Rockefeller Foundation pursues this mission through dual goals: advancing inclusive economies that expand opportunities for more broadly shared prosperity, and building resilience by helping people, communities and institutions prepare for, withstand, and emerge stronger from acute shocks and chronic stresses. To achieve these goals, The Rockefeller Foundation works at the intersection of four focus areas—advance health, revalue ecosystems, secure livelihoods, and transform cities—to address the root causes of emerging challenges and create systemic change. Together with partners and grantees, The Rockefeller Foundation strives to catalyze and scale transformative innovations, create unlikely partnerships that span sectors, and take risks others cannot—or will not. To learn more, please visit www.rockefellerfoundation.org. Lion’s Head Global Partners is an FCA regulated merchant bank, asset manager and financial advisory firm based in London and Nairobi focusing on Emerging Markets. We provide specialist advisory services in vehicle and transaction structuring, capital raising, business rationalisation and fund management services to Governments, Parastatals, Development Finance Institutions and the private sector. Our expertise lies in bringing capital markets and financial expertise to developing economies, the main sectors we cover are Energy and Infrastructure; Water, Sanitation and Agriculture; Capital Markets Development and Financial Inclusion; and Education and Healthcare. We are the Fund Managers of the Africa Local Currency Bond Fund, which was seeded by KfW and now has participation by the IFC and FSDA, and are currently structuring an off-grid solar receivables fund for the AfDB which we will also be managing. The Partners of Lion’s Head bring experience from long careers at leading international investment bank Goldman Sachs and Morgan Stanley. Bim Hundal, Partner and Chairman of Lion’s Head has over three decades of investment banking experience, including running the Capital Markets programme for Emerging Markets at Goldman Sachs for over 10 years. In 2014, Lion’s Head won the Financial Times and IFC award for “Achievement in Transformational Finance” at the Transformational Business Awards for our establishment, management and advisory role in the Global Health Investment Fund.